What better way to celebrate the end of a school year than with field day? Urban Initiatives’ Play with Potential schools across thE city pulled out all the stops and celebrated summer fun. from albany park to Roseland, Urban Initiatives REC coordinators organized special events to celebrate a year of active recess. Daley and Fulton schools started their days off with a performance by the Jessie White tumblers, getting the kids all pumped up for the rest of the fun filled day of recess games (dunk tanks, of course)! At Palmer, field day took on an Olympic theme, with class representing one of the many countries that Palmer students hail from. After the opening ceremonies, classroom competed in a dance marathon, water relays, and basketball competitions throughout the day. 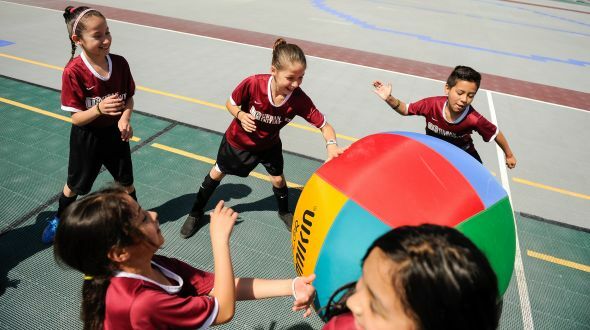 Otis school’s field day was Olympic-themed as well, and students competed for medals in the 100 meter dash, the 3 point-shooting contest, and tug-of-war. Curtis Elementary in Roseland featured healthy snacks and carnival games, as well as a much-anticipated opportunity to dunk Coach Earl, giving him a break from the heat. Nobel and Prieto schools had field day that included corporate volunteers from Nielsen and ITW respectively. Students were excited to share their end-of-the-year enthusiasm with volunteers who got to take a day out of the office to play. Following with the mission of Urban Initiatives, field days included healthy snacks, fun games, and communities coming together. 16 different schools, over 12,000 kids, and 14 different neighborhoods field days brought students together for a celebration of the school year. It looks like we’ve found our motto for another great year of sports-based youth development programming!